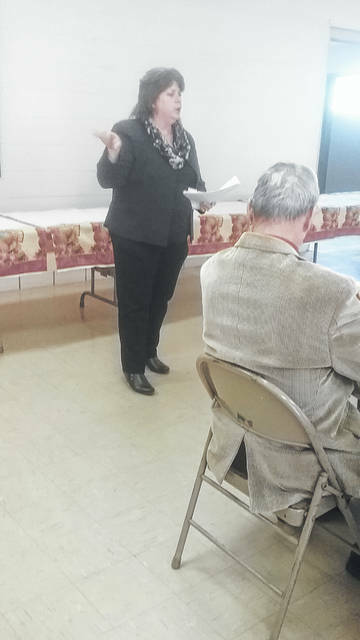 Amy Carles warns retired teachers about scams they may encounter. The Logan County Retired Teachers met in October at West Liberty First Church of God. After the delicious lunch provided by the church women, Amy Carles presented the program. Amy is from the Ohio Consumers’ Counsel. She discussed the different ways this group helps Ohio citizens as their residential utility consumer advocate. Amy shared some of the popular scams that people have experienced. All the members were more of scams and what to look out for. President Emerson Brown conducted a short meeting after the program. Member Bill Davis presented a list of names for officers for 2019, which will be voted on at the December 13th meeting. Any retired educator is welcome to join this group. The next meeting is December 13th at noon at the Logan County Historical Center in Bellefontaine, Ohio. Ms Pat Ortli will present the program. For more information, this group has a Facebook page available or call Emerson Brown at 937 404 9453. Submitted by Logan County Retired Teachers.